The mighty Toyota Tacoma has been taken down a peg by a nasty little issue with the leaf spring suspension. Apparently it's liable to "fracture due to stress and corrosion," which can mean a pointy piece of metal will repeatedly ram into your truck's gas tank and spill its contents all over the road. Basically, pickup trucks (and some other vehicles) have what look like big steel rulers connected to the rear axle as part of their suspension system. These flat, skinny slabs of steel are springy and absorb the bumps. As you can imagine, these leaf springs carry a fair bit of weight. One snapping isn't necessarily catastrophic but it seriously ruins a vehicle's suspension geometry and sharp bits of metal running among under your truck is never a good thing. While leaf tearing a leak in the gas tank could obviously lead to fire, Toyota is not aware of any fiery death or injuries related to the situation. 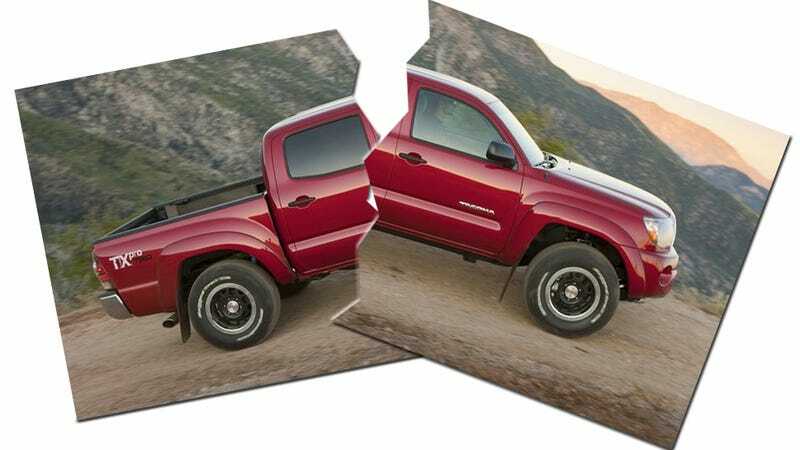 The voluntary recall is applies to 2005-2011 Tacoma 4x4 and PreRunner trucks, approximating 690,000 vehicles all up. Toyota says they're mailing out warnings to owners, and dealerships will "remedy the condition" for free. Here's the official statement from Toyota.